Joseph Romshek, 86, of Bellwood, died Wednesday, July 13, 2016, at St. Elizabeth Health Center in Lincoln. 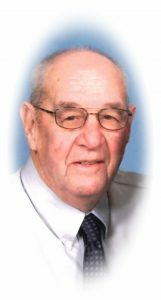 VISITATION FRIDAY 5-7 ROSARY SERVICE 7 P.M.
Joseph G. Romshek was born November 16, 1929, in Bellwood, Nebraska to Joseph M. and Ruth (Day) Romshek. He attended District 76 and Bellwood, High School. In 1951 he entered the United States Army serving in Korea where he was awarded the Purple Heart. He was Honorably discharged in 1953. On February 2, 1956, he married Mary Pat Demuth at St. Peter's Catholic Church in Bellwood where he lived most of his life. Six children were born to this marriage. After returning from Korea, Joe worked for Gerhold Concrete Company, Columbus Feed and Seed and eventually took a job with Bellwood Farmer's Coop where he worked as the Feed Department Manager for 28 years, retiring in 1995. Joe was very active in his community serving on the church board of St. Peter's where he was a lifelong member, 62 years with the Bellwood American Legion Post #327, holding many offices, the Bellwood Volunteer Fire Department for 30 years, serving as Chief for 13 years, coached Pony and Legion baseball, served on the Nebraska and Bellwood Centennial Committees and belonged to the Council of Administration at Aquinas High School. His hobbies included fishing, gardening, card-playing, sports, daily visits to the coffee shop and especially spending time with his family. Joe was well known as a good father, neighbor and for his ornery personality. Joe is survived by his wife of 60 years, Mary Pat, of Bellwood, daughters Michelle (Kent) Longenecker, David City, Amy (Bob Speicher) Romshek, Columbus, Mary Beth(Bob) Tomcak ,Bellwood, Jackie (Aaron Schmid) Romshek, Bellwood, sons Joseph M. Romshek of Omaha, Andy (Patty) Romshek of Papillion, grandchildren Matt (Erin) Longenecker, Michaela (Casey) Schleicher, Maria (Tanner) Hippen, Ben Longenecker, Jared Longenecker, Vincent Tomcak, Eric Tomcak, Sam Romshek, and Emma Romshek; great-grandchildren Kenton, Aden, Kyron, and Devin Longenecker; sister Josephine Feaster, brothers Ralph (Betty) Romshek and Jack (Betty) Romshek; brothers-in-law Roy From, Dan (Patti) DeMuth; sister-in-law Jackie DeMuth; and many nieces and nephews. He was preceded in death by his father and mother Joseph M. and Ruth Romshek; grandchildren Bryan Tomcak and Tammy Tomcak; sisters and brothers-in-law Elma and Pete Nicholas, Bernice and Leonard Nicholas, Millie and Jerome Beringer; sister Cora Lee From, brother-in-law Keith Feaster, father and mother-in law Sylvester and Arnola DeMuth; sisters-in-law Dianne Davis, Sharon Burdick, and Barbara DeMuth.